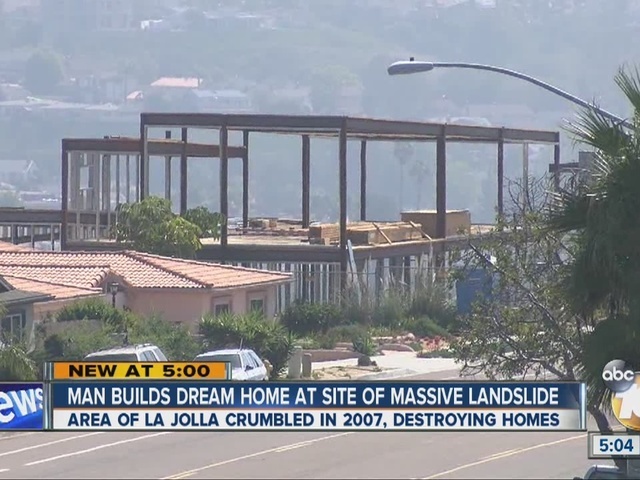 An Encinitas man is building the house of his dreams at the site of a real-life nightmare. In 2007, Mount Soledad gave way, swallowing 10 homes and devastating 100 others. Now, Eric Hoffman is building his home on the same spot where one house slid down the hill in a landslide. Hoffman claims his new house will be one of the safest on the block. "Not everyone gets a chance to buy new land," he said. Hoffman is building a 3,200-square-foot, four-bedroom home, with supports dug 60 feet into the ground. Still, he said people are warning him, saying, "Are you sure it will still be there?" His answer is a confident yes. Hoffman bought the land in 2012 for $300,000, after the city stabilized the hillside. He spent a year getting approvals and doing geological studies. "I feel like I've got a better shot of being there than the other houses around me," he said. Hoffman was one of the last to see his new home's predecessor. He said he drove by about 15 minutes before Mount Soledad crumbled. "I breathed a sigh of relief that I didn't get caught in that landslide," he said. Hoffman said he is able to get insurance for the house, which he expects will be finished in September. However, the two lots to the immediate south are still vacant. 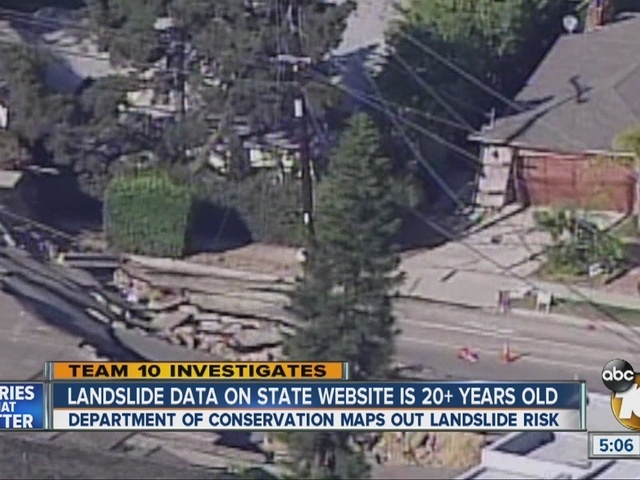 Team 10 examined the state's website on landslide risk in San Diego County and found that much of the data is outdated. Many of the maps and information are from the 1980s and 1990s. Geologist Dr. Pat Abbott told Team 10 a lot of the research on landslides happened after the El Niño storms in the 1980s. He said the website is a good starting point, but also recommends using other resources. "It's handy, like an introduction to an area," Dr. Abbott said. "If you're getting down to an area of an individual house, you're going to have to talk to an individual, it's what it boils down to. The California Geological Survey (some of the older maps probably refer to the Division of Mines and Geology, CGS' former name) had a landslide hazard identification project that was established after the 1982 storms and then was de-funded in the early 1990s. Current CGS landslide mapping is for the Seismic Hazards Zonation project , with priorities determined by both population and earthquake shaking hazard. Because San Diego has lower shaking hazards than the Los Angeles and Inland Empire regions, those regions have been prioritized ahead of San Diego for new landslide mapping. New landslide mapping in the Los Angeles region is mostly complete, but there's a lot to do in the Inland Empire before we can move on to the San Diego region.